The monster collision between our Milky Way and fellow spiral galaxy Andromeda will occur about 4.5 billion years from now, according to the new research, which is based on observations made by Europe's Gaia spacecraft. Some prominent previous estimates had predicted the crash would happen significantly sooner, in about 3.9 billion years. The future orbital trajectories of three spiral galaxies: our Milky Way (blue); Andromeda, also known as M31 (red); and Triangulum, also known as M33 (green). The Milky Way and Andromeda will collide about 4.5 billion years from now, a new study based on observations by Europe's Gaia spacecraft suggests. This work allowed the team to determine the rotation rates of both M31 and M33 — something that had never been done before, the researchers said. 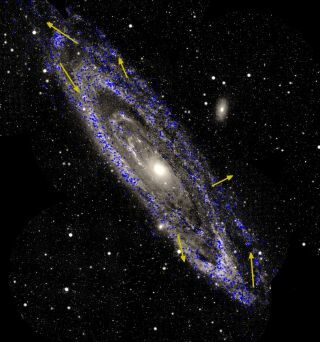 Using the Gaia-derived findings and analyses of archival information, the study team mapped out how M31 and M33 have moved through space in the past and where they'll likely go over the next few billion years. "Gaia was designed primarily for mapping stars within the Milky Way — but this new study shows that the satellite is exceeding expectations and can provide unique insights into the structure and dynamics of galaxies beyond the realm of our own," Prusti said. "The longer [that] Gaia watches the tiny movements of these galaxies across the sky, the more precise our measurements will become." By the way, Andromeda won't be the next galaxy our Milky Way slams into: The Large Magellanic Cloud and Milky Way will merge about 2.5 billion years from now, a recent study suggested.